The wizards of Wired's Danger Room blog have posted a year-end click-bait listicle identifying who they - Spencer Ackerman, David Axe, Noah Shachtman, and Robert Beckhusen - believe to be "The 15 Most Dangerous People in the World." While Paula Broadwell starts the list for some strange reason, Obama's top counterterrorism adviser John Brennan clocks in at number four (with entry author Ackerman studiously avoiding any mention of Brennan's support for kidnapping and torture or his rampant lies over the murderous drone program he oversees, or the staggering civilian death toll for which Brennan and his boss are personally responsible - maybe Shachtman should've gotten this one) and Bashar al-Assad at number two, the Danger Roomers peg Iranian Brigadier General Ghasem Soleimani (they write it as Qassem Suleimani) - head of the Iranian Revolutionary Guard Corps' elite Qods Force - as the single most dangerous man on Earth. Beckhusen, who wrote the final entry for Wired and has a history of regurgitating ignorant propaganda, begins with a truly bizarre formulation. "As the country most likely to spark a world war," he writes, "Iran has to be considered the most dangerous country on the planet." Let's read that again and then unpack it. Iran - in Beckhusen's estimation (one that he seems to think is a pretty uncontroversial assumption) - is "the country most likely to spark a world war." (emphasis added) In fact, United States intelligence has long held that Iran maintains defensive capabilities and has a military doctrine of self-defense and retaliation, but will not begin a conflict. In April 2010, Defense Intelligence Agency director Lieutenant General Ronald L. Burgess told the United States Senate Committee on Armed Services, "Iran's military strategy is designed to defend against external threats, particularly from the United States and Israel. Its principles of military strategy include deterrence, asymmetrical retaliation, and attrition warfare." Burgess' intelligence report, delivered in conjunction with his testimony, also included the assessment that Iran maintains a "defensive military doctrine, which is designed to slow an invasion and force a diplomatic solution to hostilities," and that "Iranian military training and public statements echo this defensive doctrine of delay and attrition." The identical position was reaffirmed by Burgess' testimony in March 2011, during which he explained that, if attacked, "Iran could attempt to block the Strait of Hormuz temporarily with its navy, threaten the United States and its allies in the region with missiles, and employ terrorist [sic] surrogates worldwide. However, we assess Iran is unlikely to initiate or intentionally provoke a conflict or launch a preemptive attack." This year, Burgess repeated these conclusions (which have been the consensus view of U.S. intelligence for years), reiterating that the Defense Intelligence Agency "assesses Iran is unlikely to initiate or intentionally provoke a conflict." Iranian military commanders have even confirmed this view. "Our military warfare equipment is based on deterrent policies and strategy," said Iranian Defense Minister Mostafa Mohammad Najjar in 2006, and also noted that "Iran is ready to sign a non-aggression pact with regional countries." So what does Beckhusen mean when he claims that Iran is "the country most likely to spark a world war"? While an unprovoked attack on Iran is widely seen as a terrible, "stupid" idea (and a war crime of obvious and unequivocal illegality) by those not of the neoconservative persuasion, and one that could potentially lead to a global conflagration, the idea that Iran would start such a war is not actually a consideration. Even former Israeli Mossad chief Ephraim Halevy warned, "An attack on Iran could affect not only Israel, but the entire region for 100 years." Note how the potential attack suggested by Levy is on Iran by an unmentioned aggressor, and not by Iran on any other country. Maybe that's why Beckhusen wrote "spark" rather than "start." In so doing, however, the Wired writer is effectively - in this warped thought experiment - blaming Iran for getting itself attacked by Israel or the United States. He appears to be saying that if Iran responds to a foreign military assault, it would somehow be culpable for "sparking" a global conflict, the instigator of a new world war. The twisted logic of such an assertion reveals a very specific perception of Iran as a perennial provocateur of violence visited upon itself. It is apparently irrelevant to Beckhusen that Iran's wholly legal nuclear energy program is thoroughly monitored by the IAEA, an organization that continually confirms that its program has not been weaponized and admits it has no evidence Iran has ever had a nuclear weapons program, or that the United States intelligence community and its allies have long assessed that Iran is not and never has been in possession of nuclear weapons, and is not currently building nuclear weapons. All indications are that Iran's leadership has not even made a decision to build nuclear weapons and Iranian officials have consistently maintained they will never pursue such weapons on religious, strategic, political, moral and legal grounds. Beckhusen doesn't explain how Iran - a country with no modern military history of invading or attacking any other nation, a demonstrated refusal to respond in kind to chemical weapons attacks on its own citizens, and with a military budget of roughly 4% of what the United States spends annually, dwarfed by U.S.-backed states in the region - would be responsible for sparking a military conflict were it to be attacked. Does Beckhusen think that by consistently offering to curb and cap its enrichment program, accepting international cooperation in its energy sector and taking significant scientific and technological steps to reduce its medium-enriched uranium stockpile in an effort to allay fears of possible militarization of its program, Iran is acting provocatively? 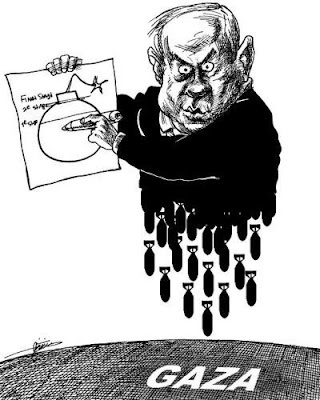 Are we to believe that, in the event the United States or Israel initiates a war of aggression against Iran - thereby committing the "supreme international crime" as defined by the Nuremberg Tribunal - that Iran should be seen as "the most dangerous country on the planet"? For decades now, headlines around the world have routinely speculated and asked, "Will Israel Attack Iran?" Not the other way around. Who is currently terrorizing civilian populations and killing an extraordinary number of children in at least six foreign countries with flying robots; has an arsenal of over 5,100 nuclear warheads; is responsible for three-quarters of the global arms market, flooding the world with weapons to the tune of $66.3 billion last year alone; is itself the gun violence capital of the world; maintains the most sophisticated and lethal military on the planet and a global empire with more than 1,000 military bases and installations all over the world, and whose bought-and-paid-for legislative body stridently works to literally outlaw diplomacy and lay the groundwork for more war forever and ever? Who begins reelection campaigns by murdering over 160 people in an aerial bombardment of an impoverished, caged, blockaded and besieged refugee population; constantly violates ceasefire agreements to commit war crimes; threatens to attack sovereign nations on a regular basis; continues an over four-decade-long illegal military occupation in order to fulfill its century-old founding settler-colonial ideology and displace, dispossess and disenfranchise its indigenous population; has a citizenry that readily accepts apartheid policies in order to maintain privileged ethnic supremacy over indigenous minorities; and has been found to be the world's most militarized nation for nearly 20 years in a row? Who do the majority of people living in Iran's neighboring and regional nations fear the most? Iranian officials consistently speak out against the possibility of a new war. The Iranian Ministry of Intelligence, in a recent report suggesting that direct negotiations with the United States could resolve the standoff over the Iranian nuclear program and begin to lift decades of Western-imposed sanctions, stated, "One way to fend off a possible war is to resort to diplomacy and to use all international capacities," adding that, as the risk of war appears high, "it is an unforgiveable sin not to prevent it." Meanwhile, the threats against Iran continue unabated. Beckhusen also fails to note that in the past few months, the United States led a massive naval war game exercise in the Persian Gulf, amassing the floating firepower of nearly 30 countries just off the southern coast of Iran, and is rapidly arming its dictatorial Gulf allies with more and more weapons while replenishing the stockpiles of Israel after its eight-day bombardment of Gaza in late November. The Washington Times recently reported, "The largest infusion of U.S. arms ever for Persian Gulf allies has shifted more toward offensive weapons at the same time that President Obama’s military strategy says it will rely more on allied firepower in any future war," and added that due to "U.S. sales of air defense-penetrating F-16s and F-15s, satellite-guided bombs and a pending order for ordnance that can burrow deep and then explode, analysts say Gulf nations could participate in a U.S. air campaign to strike Iran's nuclear sites." Business Insider reports, "This week the U.S. Department of Defense notified Congress of a $647 million agreement to provide the Israel Air Force with 10,000 bombs — more than half of which are bunker-busters — along with 6,900 joint direct attack munitions (JDAM) tail kits, which convert unguided free-fall bombs into satellite-guided 'smart' weapons." Yet it is not Iran that is flying drones in American airspace; it is not Iran that is engaged in cyberwar and industrial sabotage against the United States; it is not Iran that is murdering American scientists on the street in front of their families; and it is not Iran that is collectively punishing the civilian population of foreign countries in an effort to force their governments to relinquish their inalienable national rights and attempt to instigate regime change. Beckhusen's attempt to establish Iran as the most dangerous place on Earth (a formulation lifted wholesale from Netanyahu talking points) reflects a perpetual and practically pathological predisposition in the mainstream narrative - both liberal and conservative - to view the Islamic Republic of Iran as a sinister domain of unadulterated violence and malevolence; or, as the common refrain goes: "Iran poses the greatest threat to the stability and security of the Middle East and the entire world." Never mind that a majority of knowledgeable foreign policy and security experts consider such a statement to be not only a gross exaggeration, but a total absurdity. Naturally, Beckhusen doesn't elaborate on his opening statement, but assumes his readers agree and moves on from there. In making the assumption that Iran is the "most dangerous country," Beckhusen then seeks to identify "the most dangerous man in that most dangerous country," and (taking his cue from the neoconservative American Enterprise Institute) hits upon General Soleimani, whom he describes as "ruthless and mysterious," just like all caricatures of nefarious Orientals. ...if Barack Obama or Bibi Netanyahu were to strike Iran's nuclear program, it'll be Suleimani and the Quds Force in charge of taking Iran's counterattacks beyond its borders, as Iran launches waves of commando and terrorist strikes against the U.S. and its allies across the region and the world. Yes, you read that correctly: if the elected leaders of the United States and Israel - one a Nobel Peace Prize drone murderer, the other a cartoon bomb enthusiast/racist sociopath - defy the wishes of their own citizens by launching an illegal military adventure against Iran, the "most dangerous man" in the world is the guy who would be tasked with retaliating, not the ones who actually launched the attack and started a new war. That's like saying you consider the polar bear at the Central Park Zoo to be the most dangerous animal in New York City because, if you punch it in the face, it might bite your hand off. One would be hard-pressed (to use Beckhusen's verbiage) to explain how responding to an unprovoked assault (a war crime in international law) by targeting the heavily-armed, uniformed soldiers of the world's only superpower stationed halfway around the world could reasonably be considered terrorism, by any stretch of that politically manipulated term's increasingly irrelevant definition. So, to sum up: Starting a world war? Whatever. Responding to a military attack on your country? DANGEROUS! By perpetuating fear-mongering propaganda about Iran, it appears that the most dangerous thing in Wired's Danger Room might actually be its own staff. Benjamin Netanyahu, not dangerous according to Wired's Danger Room. re: "if the elected leaders of the United States and Israel defy the wishes of their own citizens by launching an illegal military adventure against Iran . . ."
I question your use of the verb "defy." Not since FDR first rolled out a massive anti-German propaganda, then dissembled to take the American people to war in 1945, has the question of whether the USA should go to war been placed before its citizens. Article 1 Sect. 8 grants to Congress the power to declare war. As former director of national security Michael Hayden told students at Univ. of Michigan's Ford School of International Affairs several months ago, the invasions of Afghanistan and Iraq relied for legitimization on Congress's Authorization [to the President] to Use Military Force. That is, Congress abdicated its responsibility and subverted the right of the people to decide, through their representatives, IF the nation should go to war, and IF and HOW the nation would pay for that war. But the US Constitution does not give the President of the USofA the right to declare a war, much less to do so in an off-hand speech. More nonsense from IRI apologist Nima Shirazi. I'd really love for this Nima character to meet Qassem Suleimani and the Quds force and see if they'll be buddy-buddies with him. Go back to Brooklyn you moron. While I know this question will only invite more stupidness on your part, I'm still curious: What in this post is "nonsense" and apologia for the Iranian government? Please point to something that is not true or that you believe whitewashes or justifies actions taken by the Iranian government that could be seen as indefensible. Also, while the "buddy-buddies" comment is simply odd, I should point out that it also makes no sense in the context of your pathetic accusations. I mean, if you actually think I'm an apologist for the Iranian government, wouldn't it then make sense that I'd get along rather well with Soleimani and the Qods Force? Also, if you insist I go back to Brooklyn, where do you think I am now? Let's see, your articles are thinly veiled as pro-IRI. It's not like you come out and say "Hey I love Khamenei" but your articles all have a defensive posture about it to suggest "hey guys, Iran's isn't that bad!!!" Which is fine and dandy if you truly believe in the Iranian system, in which case, I strongly urge you to move there. On the other hand, you have absolutely no problem blatantly and harshly condemning for every single action it takes. Every single one. You have no problem talking about Bill Maher for a "stupid" comment he made on some random show or article or Susan Rice because it offends your dear Arabs and Palestinians, but you take SUCH CAREFUL consideration and even avoid the topic all together when writing about Iran.